Why are Uranus and Neptune Blue? It is perhaps the most commonly known thing about Uranus and Neptune that they are very blue. The other thing people know about them is perhaps that they’re cold. While this is an amusing coincidence relating to our associations between the color and temperature, they are not directly related. In this lab, we will examine and discuss a brief history of each planet, then try to understand not only what their colors are and what causes the color, but how we can tell what causes the color. Since many other astronomers besides Herschel viewed Uranus, it could be concluded that the first observations of Uranus led astronomers to conclude that it was just a star. However, Herschel’s discovery saw Uranus as a small tiny green-blue dot. At first many, including Herschel, believed it to be just a comet, but then astronomers concluded that it was a planet that was orbiting the Sun that was located past Saturn. In 1977 Uranus had crossed in front of a star that was being observed by NASA’s Kuiper Airborne Observatory and it was then concluded that Uranus had five rings which blocked the star’s light intermittently at equal intervals on either side of the planet. Voyager 2 discovered two more of Uranus’ rings, bringing the total to seven. In 1985 Voyager 2 was located fairly close to Uranus. This allowed astronomers to study the images of Uranus that were sent from Voyager 2 to Earth. 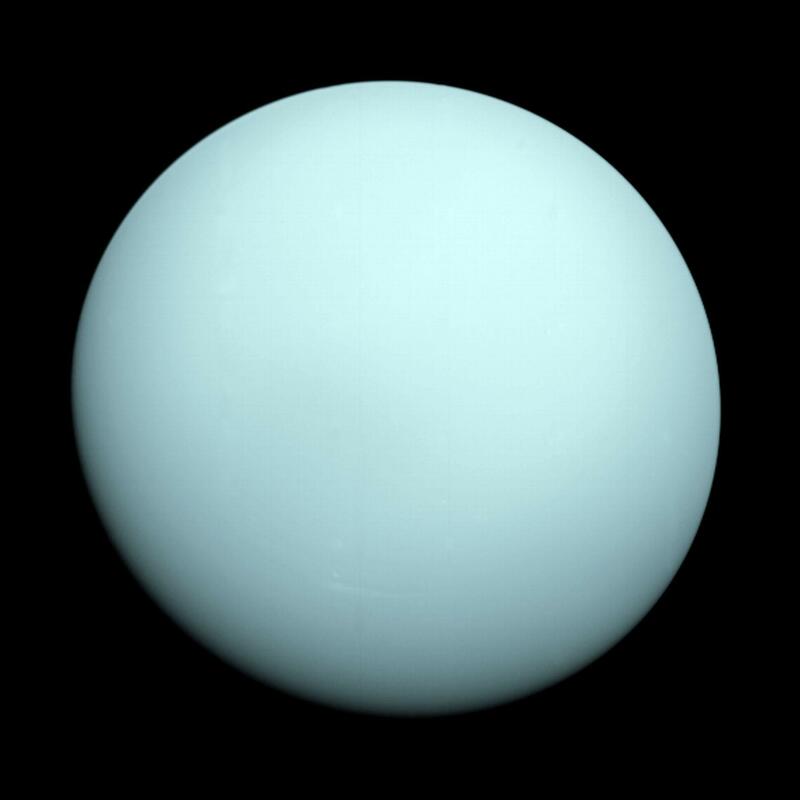 Uranus was a pale green-blue ball that had no evident clouds. It was January 24th 1986 when Voyager 2 got the closest, and the first good pictures of Uranus were taken. With these images, astronomers saw that Uranus was a featureless planet. However, the Hubble Space Telescope was able to to show that it was in fact, not featureless, because the telescopes were able to view changing clouds on Uranus and a dark spot that may be a vortex.1 Unfortunately, Voyager 2 was the only spacecraft ever sent to Uranus, and no others are currently being planned. The discovery of Neptune was not as accepted as the discovery of Uranus as there was controversy around who should have been given credit for the discovery. To sum up the lengthy story of discovery, Urbain Le Verrier and John Couch Adams had made calculations predicting the existence and location of Neptune, and they were sent to an observatory in berlin where it was actually spotted. The Voyager 2 was helped bring great new insight and data towards the study of Neptune. Before 1989 there was not an abundance of information known about Neptune; however, Voyager 2 was able to divulge images that provided more insight into the Neptune. These pictures not only showed that Neptune was marked by belt-zone circulation that was parallel to Neptune’s equator but they also showed cyclonic disturbances, at least four of them, with the largest one later called the Great Dark Spot. Interestingly enough, when Hubble Space Telescope yielded images of Neptune in 1994 the Great Dark Spot was no longer there. The Hubble Space Telescope also showed new evidence of clouds that were visibly appearing and disappearing in Neptune’s atmosphere. It was also the Voyager 2 that discovered six of Neptune’s small moons, with three moons already known prior and five were found after Voyager 2.1 This information about the history and observations about Uranus and Neptune sets the background to answer the investigating question of why Uranus and Neptune appear in a green-blue hue. Uranus is the seventh closest planet at 2.877 billion kilometers to the Sun, and is significantly larger than Earth4. The mass of Uranus is roughly 86.8 x 1024 Kg, with a mean radius of 25, 362 + 7km and a polar radius of 24, 973 + 20 km4. The planet is classified as a Jovian planet, meaning it is a large, low-density planet with thick atmosphere and liquid or ice interiors3. Uranus can also be classified as a Superior Outer Gas Giant where it is outside the orbit of Earth, the asteroid belt, and has a gaseous structure7. Uranus takes 84 Earth years to go around the sun once however Uranus’ days only last 17.2 Earth hours3. The rotation of Uranus is peculiar as its axis is tilted almost perpendicular to its orbit at 98°. As the planet rotates, it maintains the direction of its axis in space. This leads to extreme season on the planet’s surface as winter lasts 21 years, a point on the surface will go that time without ever seeing the sun.3. The composition of Uranus’ atmosphere is dominated by the presence of Hydrogen and Helium6. Other gases include methane, ammonia and water. The gases blend gradually to form a fluid interior while the planet has a blue-green color due to the presence of methane3. The temperature of Uranus’ atmosphere is ~ -300° F3. Astronomers have difficulty accurately describing the interior of Uranus due to the high percentage of hydrogen in the atmosphere (26%)3. It is believed that Uranus is composed of 3 layers: an atmosphere composed primarily hydrogen and helium, a deep mantle made of ice and rock and a heavy-element core3. Uranus is often called an Ice Giant due to the large proportions of solid water inferred to be in its interior3. Uranus and Neptune are believed to have been formed in the solar nebula along with the other Jovian planets; calculations have shown that Uranus and Neptune could not have accumulated enough material to grow to their present sizes in the slow orbits they occupy so distant from the sun3. Computer models have suggested Uranus and Neptune were formed closer to Jupiter and Saturn and that gravitational interactions among the Jovian planets could have eventually moved the planets outward3. The highly inclined axis of Uranus may have been the result of being struck by a planetesimal roughly the size of Earth late in its formation2,3. Another theory suggests that its peculiar rotation could have been formed by tidal interactions with Saturn as it migrated outward3. Neptune and Uranus are very similar so oftentimes that is why they are compared to one another and discussed together; however, both planets also differ from one another3. Neptune is the eighth and farthest planet at 4.498 Billion km to the Sun and considered the last one in our solar system of significant size, and is very similar to Uranus4. The mass of Neptune is roughly 102 x 1024 Kg, with a mean radius of 24, 622 + 19km and a polar radius of 24, 341 + 30km4. Neptune rotates on a counter-clockwise rotation and one rotation is about 16.1 earth hours4. Similarly to Uranus, the classification of Neptune is that of a Superior Outer Gas Giant where it orbits outside of earth’s orbit and the asteroid belt, and has a gaseous structure7. Neptune is also classified as a Jovian planet, again similar to Uranus3. Neptune’s atmosphere, which is similar to Earth, is mainly full of iron with other metals and the atmosphere is mostly Hydrogen and Helium with traces of methane to give it the well-known blue color and just below this is a “mantle layer” of ammonia and water5. The methane combined with the atmosphere full of Hydrogen absorbs red light, which is why Neptune gives off the blue-green color it is commonly known for3. Neptune has more internal heat than Uranus does. The same calculations that allowed Uranus’ interior to be known about are the same one’s used to find out about Neptune’s interior3. Neptune also has a similar atmosphere to Uranus in the sense that it is quite hazy3. Also, like Jupiter and Saturn, there are significant amounts of heat, which flows out from the interior of the planet3. Comparing Neptune and Uranus given the facts above will show very similar traits with a few differences given our present day knowledge of the characteristics of each planet. The size, atmospheric composition and classification is similar, while the rotation is different. A key atmospheric distinction between the planets is the cloud features of Neptune compared to a relatively featureless Uranus3. Images captured by Voyager 2 Spacecraft shows that Neptune is marked by a dramatic belt-zone circulation, parallel to the planet’s equator, as well as four cyclonic disturbances3. A great Dark Spot was also observed in the Southern Hemisphere of the planet3. Uranus was previously believed to be relatively featureless until the Voyager 2 Spacecraft passed by3. It observed small methane clouds and atmospheric banding that, although faintly visible, suggest the presence of belt-zone circulation similar to that of Saturn and Jupiter3. The importance to research this topic will give more insights into how Neptune and Uranus act in a physical sense, and what they are made up of which can be very information in comparing with each other and understanding them comparatively to earth. The color of Uranus is a blue-green color, and the color of Neptune is a bright azure blue. The reason this is the color of Uranus is due to its atmosphere and its ability to absorb different bands of light. Similarly, to Saturn and Jupiter, Neptune and Uranus’ atmosphere are composed mostly of hydrogen and helium, with a smaller amount of methane, and trace amounts of other elements and molecules such as ammonia and water. The methane in the atmosphere of Uranus and Neptune is what causes their colors to appear blue-green and bright azure blue respectively. When the sunlight is applied to a surface it can reflect light back, but since methane is present it absorbs the red light of the light spectrum, thus the only light being reflected is the blue and green light. Uranus and Neptune’s colors are derived from the ability of methane in each planet’s atmosphere to absorb red light. However, a difference in hue indicates a different composition. In addition, the more availability of light will allow for a more light to be reflected causing a stronger spectral signature. Another reason there is differences in color between Uranus and Neptune is the roughness of the surface at which the light is reflecting off of. Uranus has a featureless atmosphere, while Neptune has fast moving clouds and short lived storms. Since Uranus’ reflecting surface appears to be quite smooth, the light that reflects off the surface appears constant, and most of the light that hits Uranus gets reflected outwards other than the light that gets absorbed of course. On Neptune, since there is a lot of movement in the atmosphere, the surface that light reflects off of is actually quite rough, and will cause light to reflect in a non-uniform way. The diffusive effect of reflecting light causes a weaker spectral response and thus can appear as though the light is not as prominent in the reflection on a rough surface than it can on a smooth surface. Uranus and Neptune would have similar spectral responses if it were not for the variation in distance, as well as surface roughness. How do we know what causes Uranus and Neptune to appear blue? The key to determining the cause of the color of a planet lies in light. While this may seem obvious, since the color of a planet is based on light, there is a much more sophisticated way to use light to determine more precisely what materials ie. elements and compounds cause the colors that we see. The answer lies in spectroscopy. Spectroscopy refers to the process of examining the spectrum of light reflected off the planet. Spectroscopy can also be used on stars to determine things like its composition, temperature, size, etc. It works because when light strikes an electron, it can absorb a specific wavelength and move to a different orbit. Thus, when you break a white beam of light into a spectrum and magnify it, you can actually see little lines, as if a tiny pieces are missing in the spectrum. Different materials at different temperatures have tendencies to absorb (or even emit) particular wavelengths. In labs on earth, we can test which materials create absorptions lines based on what temperatures, and we can compare that to the spectral lines we see on the light from the planets, such as Uranus or Neptune. In this case, we can see that there is a large amount of methane gas in both atmospheres, which explains the blue hues in both planets. 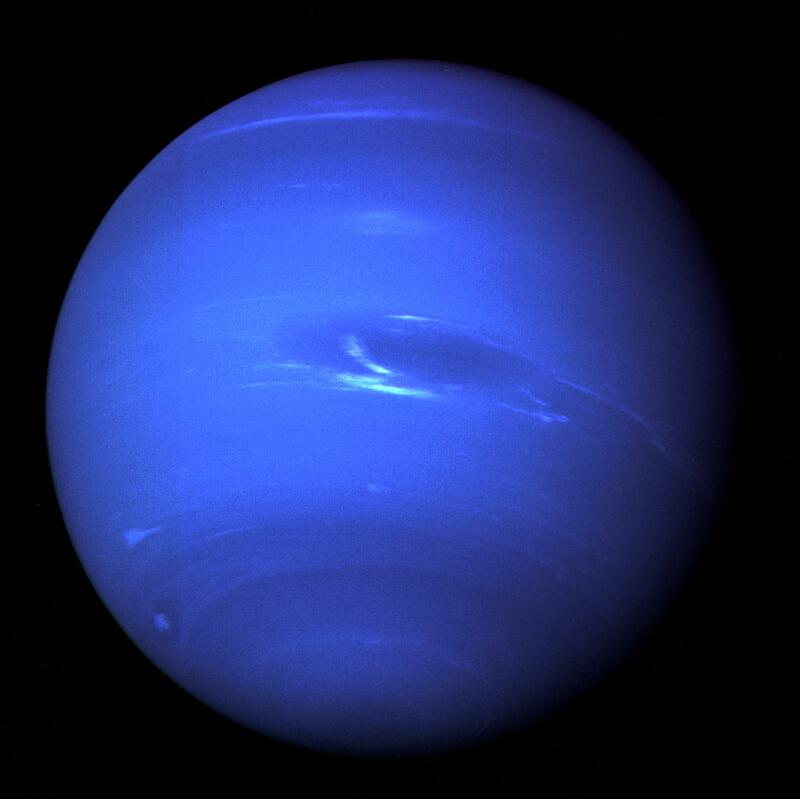 5 N. T. Redd, What is Neptune Made of? (2012).